This is why the 40-Year Reunion for the NNHS Class of 1963 was postponed! Chesapeake Avenue. 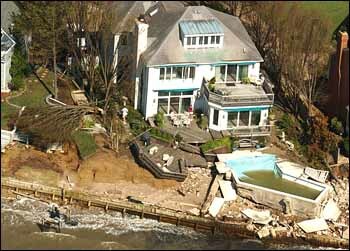 Residents pick up the pieces around their waterfront home Friday morning in Hampton. 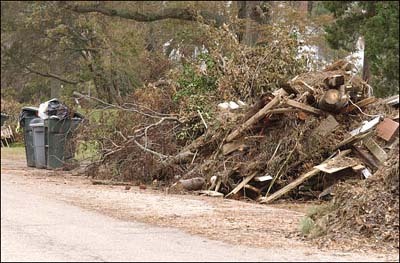 Trees litter the streets of a subdivision off of Chesapeake Avenue in Hampton Friday after high winds from Hurricane Isabel hit the area Thursday. 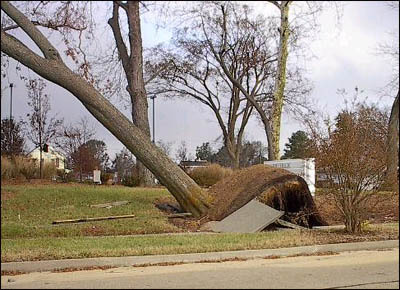 High winds uprooted this tree - and the sidewalk -- on Chesapeake Avenue in Hampton. 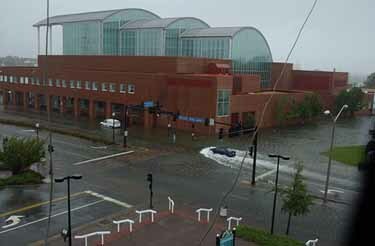 where rising water was threatening the Virginia Air and Space Museum. The Radisson Hotel where the 40th Reunion for the Class of 1963 was to have taken place on September 19 and 20 is just out of the camera's range in this shot. 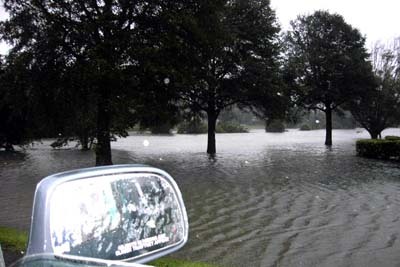 The creek beside Parklawn Cemetery on Armistead Avenue in Hampton. Some of the graves were under water. This pier ended up in a residential yard after Hampton Creek flooded downtown Hampton. 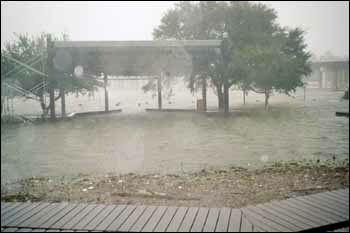 Flooding of the stage area in Mill Point park in Hampton due to the storm surge from the hurricane. and this is the first time that water came into it. We had 31 inches of water in the garage and 6 inches in the house. then Isabel on September 18, 2003.
kitchen and utility room, but felt we could not do it ourselves. We also wanted to take up the carpet downstairs and sand and restain the floors. Again, we felt we could not do it ourselves. However, after Isabel, we found out we could because we had no other alternative! My son helped and together we took out walls, took up tile floors that were over linoleum, which was over hardwood! I never thought our hands and backs could do it but when you don't have money (didn't receive insurance money for 3 months), you find you can do a lot yourselves in order to make your house safe to live in. We had to remove wet insulation, carpet, floors and walls. for two weeks to dry the house. My neighbors are still in FEMA trailers. still not finished with the steps inside the house) without hurting ourselves. You find inner strength that you never thought you had. Plus, you also find help where you never thought you would. Other states and our own city came through with food, cleaning items, clothes, etc. I cried when I saw our local middle school gym full of these items. I took what I needed and then went home to find items I could donate to help others. While it was a horrible time, I believe it was a spiritual time. and that we were able to reach out and help others as well. I will never take anyone or anything for granted again as you may not have that person or that cherished belonging when you wake up the next day. GASP! Thanks for sharing all this with us, Dee! 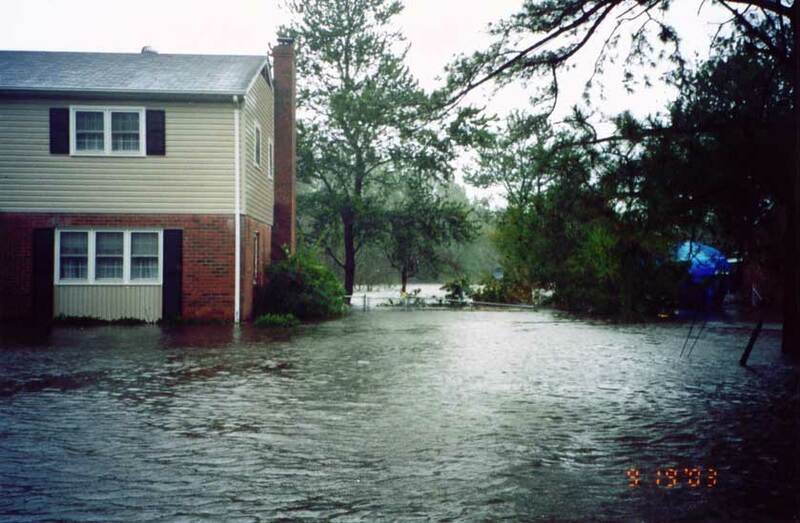 and are indicative of the kind of damage all over Hampton Roads." Additionally, there are more images from the City of Norfolk's Home Page. "Greetings.....just to say that we are ok and our house and contents are fine. 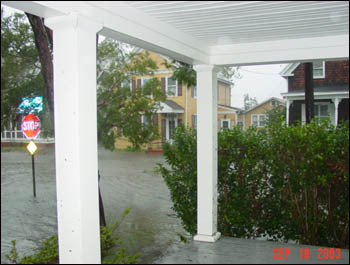 Isabel was an awful storm.....and so many friends/neighbors have great damage....we are so fortunate!!" Courtesy of Janice McCain Rose of Chesapeake, VA - 09/22/03. 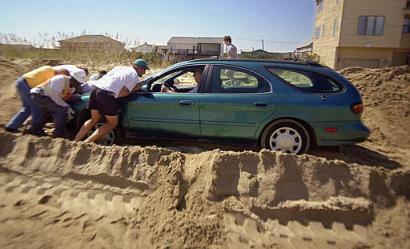 A group of men attempt, to no avail, to push a car stuck in several feet of beach sand on Sandfiddler Road in the Sandbridge area of Virginia Beach, VA., Thursday afternoon Sept, 19, 2003. 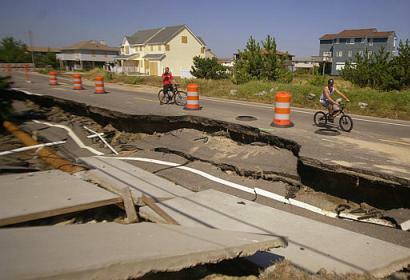 Two boys on bicycles peddle past a washed out section of Sandpiper Road in the Sandbridge area of Virginia Beach, VA., Friday afternoon Sept. 19, 2003. 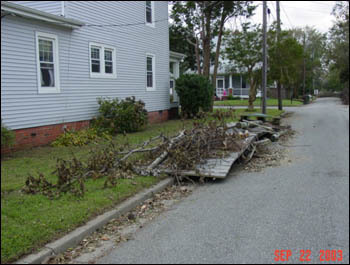 The road was damaged by Hurricane Isabel as it ripped through the area Thursday. 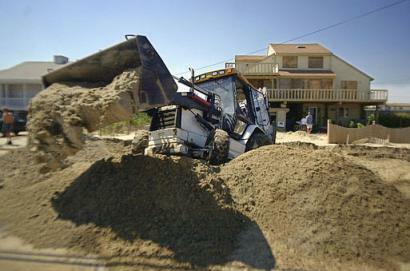 A bucket loader removes beach sand from Sandfiddler Road in the Sandbridge area of Virginia Beach, VA., Friday afternoon Sept. 19, 2003. High winds and surf from Hurricane Isabel covered area roads with several feet of sand in places. "York County was nailed by Isabel, 2nd highest damage estimate, thus far-there's more to come - on the Peninsula. I can certainly identify with Sarah and all the red tape involved in the insurance dealings. Boy, how they love to collect premiums and hate to pay claims! I lost a 75' 30+ year-old beautiful, shade giving maple tree to that 'lady', Isabel - and some other minor damage. 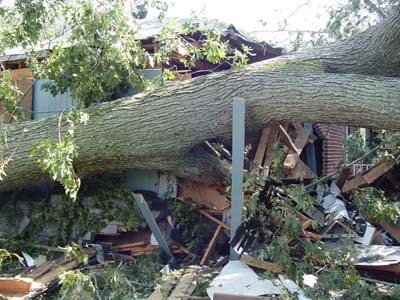 "Regrettably, the tree took out about 4 sections of my neighbors fence and a nice grape vine. The good news is that it missed all houses and out buildings. The wind took 'care' of some of the sheds! as soon as possible and help in any way I could. She wasn't home, having fled the scene prior to Isabel's arrival. of the 'dumbest' laws on the books in VA - and other states! BUT who gets hit by it!!! AMAZING! Keep a weary eye on your NEIGHBOR'S trees. and now this one to the wind, come tax time, I'm going to own the government. So, you'd better be nice to me! "I sincerely hope that all are well and will soon find normalcy once again, as they define normalcy." 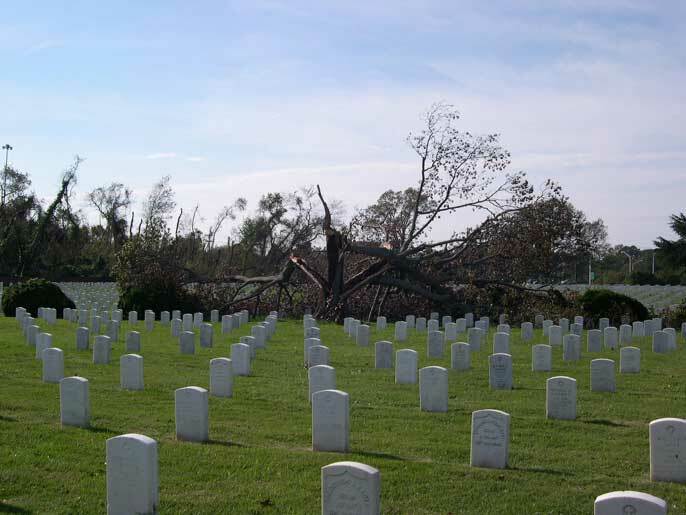 Kenny Branch ('62) of AR sent us these 18 images of destruction on 09/26/03. 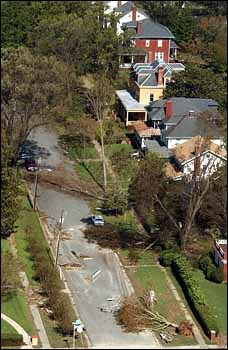 "Hurricane Isabel hit the North Carolina coast Sept. 18 skirting north along I-95 and traveling through eastern Virginia before weakening near Washington D.C. By hurricane standards, Isabel was a second-rate storm, peaking at a category 2 on the 1-5 elevated hurricane scale. Wind speed rarely blew into triple digits. 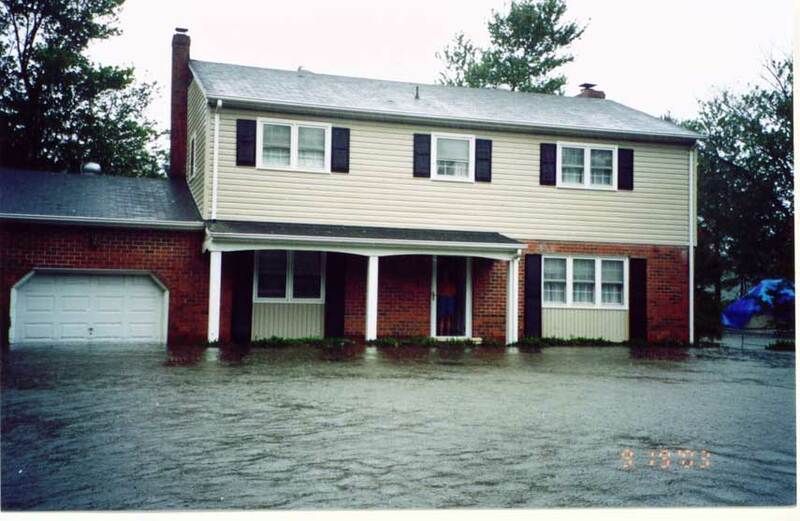 But what Isabel lacked in gusts she made up for in timing and shiftiness -- stirring up high-tide flood waters that forced some 700 Carteret County (VA) residents from their homes..."
Dave Spriggs ('64), USNA ('69) of Norfolk, VA - 09/22/03 and 10/01/03. * A new method of non-lethal torture - showers without hot water. * Dominion Virginia Power and VDOT are the same company - not really: their abilities to plan are strikingly similar. * A 7 lb bag of ice will chill 6 -12 oz. Budweiser's to a drinkable temperature in 11 minutes, and still keep a 14 pound turkey frozen for 8 more hours. * There are a lot of damn trees around here !!! * Flood plain drawings on some mortgage documents were seriously wrong. * Contrary to most Hampton Roads natives' beliefs, speed limit on roads without traffic lights does not increase. * Just because you're 35 doesn't mean you can stay out as late as you want. At least that's what the Hampton cops told me during curfew stop. * When required, a Lincoln Continental will float, doesn't steer well but floats just the same. * 27 of your neighbors are fed from a different transformer than you, and they are quick to point that out! * Clothes Hampers were not made to contain such a volume. * Your water front property can quickly become someone else's fishing hole. * Tree service companies are under-appreciated. * I learned what happens when you make fun of another state's blackout. * MATH 101: 30 days in month, minus 6 days without power equals 30% higher electric bill ????? * I can walk a lot farther than I thought. * Water will indeed fill the Midtown tunnel if the floodgates aren't shut during a flood. I was pretty sure that was true but it has now been proven. 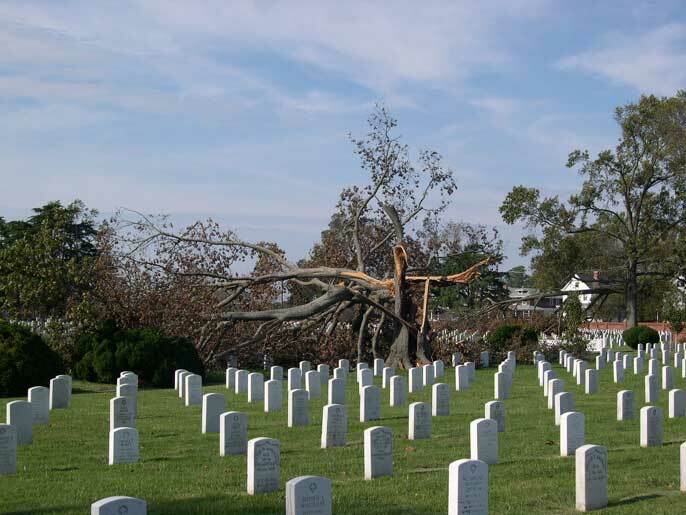 at the Tomb of the Unknowns if Hurricane Isabel became too dangerous. "We made the decision we were going to stand where we were," said Army Sgt. 1st Class Fredrick Geary, 37.
seven soldiers take urns manning the tomb where the first unknown soldier was buried in 1921.
to march for 5-1/2 hours before the tomb against heavy rain and 60 mph wind gusts. 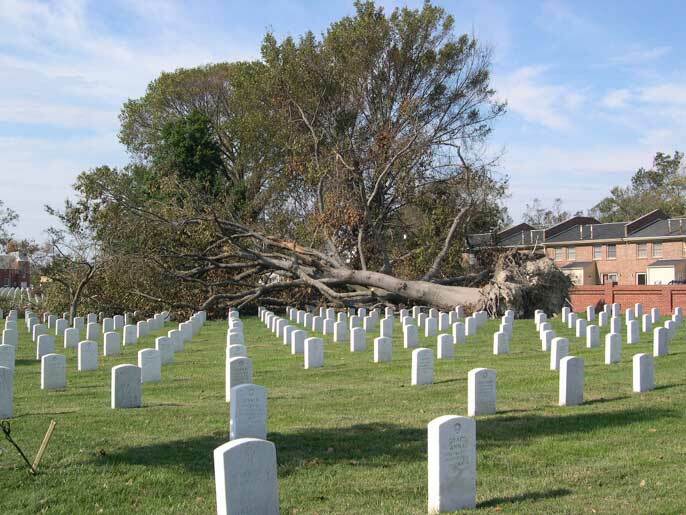 The wind was so strong that it felled at least 24 trees on cemetery grounds, most more than 20 years old. In turn, three headstones were crushed. Crews began working at 4 a.m. Friday to clean up the 612 acres scattered with downed trees and limbs. 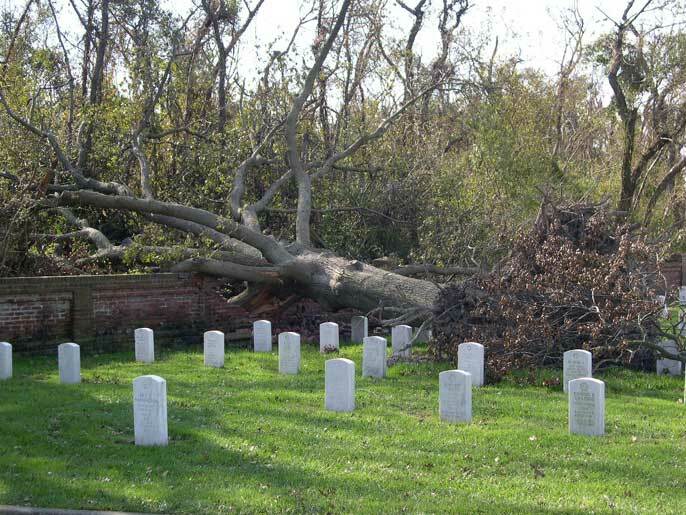 The tombstones could be replaced within two weeks, officials say. "Did they volunteer? Did they get drafted? How did they die? They did their job and this country paid them back by not remembering who they were. We have a job to do here and at no time was a life in danger. "It was my life. I was just doing what I believed to be right." "Riders on the Storm" lyrics courtesy of http://www.lyricsdepot.com/the-doors/riders-on-the-storm.html.